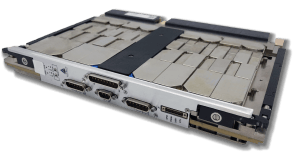 In addition to the currently available products listed here, Azure has many new products in development with an expanded selection of form factors, including 3U and smaller SWITCHBLADE variants and custom form-factors for specialized applications. 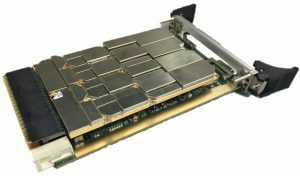 The SWITCHBLADE Coherent Wideband Digital RF Transceiver Card provides fully-adaptive coherent multi-channel sensing that fits within a single 6U VPX chassis slot. Each card consists of a Digital Signal Processing board outfitted with up to four “Plug-and-Play” Digital Tuner Modules (DTMs). 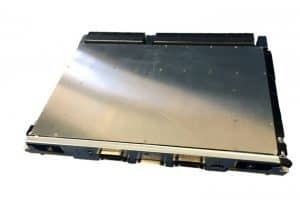 DTMs come in Single-Channel 500 MHz IBW or Two-Channel 80 MHz IBW variants and can be mixed on a single card for up to eight coherent 80 MHZ channels (total IBW of 640 MHz), four coherent 500 MHz channels (total IBW of 2 GHz) or any combination in between. Programmability: The card set includes two onboard Xilinx® Virtex-7™ FPGAs that control the Tuner Modules and implement equalization, resampling, and VITA 49 Digital IF. The FPGAs are sized for complex signal processing, including RADAR pulse processing, beamforming, detection, recognition, and spatial DF. An onboard Keystone-II chip provides additional signal processing with its quad-core ARM processors and octal-core DSP processors. Configurability: SWITCHBLADE provides runtime configurable coherency modes for spatial processing and DF. The FPGA and DSP resources can be runtime configured to do other signal processing tasks simultaneously with the VITA 49 digital IF output, including greater than 1000 narrowband IQ streams, N-channel DF, beamforming, or wideband high-dynamic range ELINT. Tunability: 80 MHz Modules can be tuned over 100 MHz to 6 GHz. 500 MHz Modules are available in 100 MHz to 6 GHz, 100 MHz to 18 GHz, and 6 GHz to 18 GHz variants. Scalability: Card sets can be combined for increased numbers of coherent channels and/or IBW. IF outputs are over the front panel and digital IF (VITA 49) outputs are available over the VPX data and expansion planes. 80 MHz modules are sampled at 240 MSPS and 500 MHz modules are sampled at 1.4 GSPS at 14 bits. Digital IF can be decimated for lower sample rates as required. Data/expansion plane protocols are configurable for PCIe 3.0, 10GbE, Infiniband, SRIO, 40GbE and others. 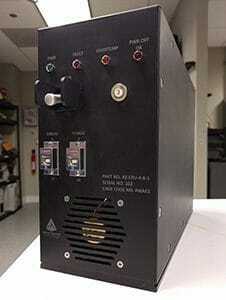 Analog IF is also available for legacy systems and can be set to 160MHz if desired. One or more RF Transceiver cards can be used with the SWITCHBLADE 16×12 Non-Blocking Switch Matrix for seamless, flexible, low-latency aperture and tuning mode selection across the full matrix of combinations for 16 different apertures and 12 different tuner channels. 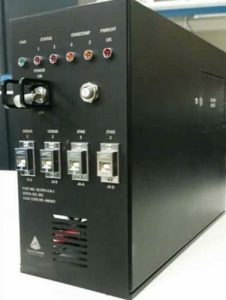 The switch can be controlled by the transceiver and provides 16 inputs to 12 outputs switching from 1.5 MHz to 6 GHz with greater than 60 dB isolation (>70dB typical) in a compact, single-slot 6U VPX form factor. 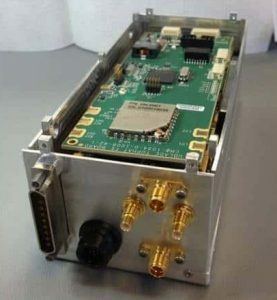 The MICROBLADE Miniature Coherent Digital RF Transceiver is a fully functional multi-channel transceiver system that produces high-rate detection, direction-finding (DF) and geolocation for low-SWAP airborne Intelligence, Surveillance and Reconnaissance (ISR) applications and supports the full range of other array processing applications. MICROBLADE is ideal for low-SWAP ISR applications on small UAS or manned platforms, having a total system weight, including antenna array and cables, of approximately 1 lb. The scalable design allows for increasing processing power and coherent channel count by simply stacking multiple transceivers together. Microblade provides 56 MHz of coherent instantaneous bandwidth per channel from 70 MHz to 6 GHz. The unit is controlled via an Ethernet interface and can report AOAs, covariance matrices, and geolocation. It produces greater than 2000 DFs/second with better than 1-degree accuracy (depending on the available array geometry). The system has been integrated and deployed with the Minotaur system and can be readily deployed to other Minotaur based platforms. System Solutions: Azure has developed multiple end-to-end system solutions for a variety of customers across the DoD including turnkey DF systems, collision-avoidance radar for UAVs, UAV comms links, and electronic countermeasures, all hosted within our flexible multifunction RF hardware suite.